.The flood of 13, 000 years ago receded. .Prince Enki, Chief Scientist for the Goldmining Expedition from the planet Nibiru to Earth, dug up the seeds under the Lebanon Platform above the Cedar Forest. In his lab, he quadrupled the grain chromosomes and had Ziasudra’s son run bakeries for the re-builders, then had him supervise the laborers. Ninurta and Enki mapped a dam, sluice and canal system for Sumer. Adad surveyed fruit trees that lived and found grapes Ninmah brought from Nibiru. Earthlings again grew white and red wine grapes. The plants, animals, guidance and knowledge the gods gave let us multiply. We built them magnificent temples and cities. To make cities, they showed us brickmaking, taught us to make bronze impliments. They let us help them build a new spaceport on the Sinai Peninsula. The gods showed us to reinforce bricks—fire them with chopped reeds in a kiln. With the bricks, we paved roads. With the strengthened bricks, we could raise highrises and temples. They gave us kiln-furnace technology and with the kilns, we forged Earth’s first durable pottery–cups, bowls, plates, urns, storage urns. They showed us how to weave fiber into cloth, make flour, bread, porridge, cakes, pastries, biscuits, yogurt, butter, cream, cheeses, beer and wine. Our communities grew. Enlil, his sons and his grandchildren ruled Sumer: Innana, Elan (southeast); Adad ruled the Taurus Mountains, Asia Minor and the northwest. Ninurta reigned in the highlands; Nannar, controlled the North. Utu commanded Lebanon’s Airport. Nibiru’s perigee 13,000 years ago created the Deluge and also “ripped away the shield of gold dust around Nibiru, gold the astronauts struggled for millennia to ship to the mother planet. Nibiru’s atmosphere was again dwindling. The mother planet again desperately needed Earth’s gold. While survivors on Earth rebuilt their lives, word came from Nibiru, ‘The shield of gold dust was torn.’” Nibiru ordered the Expedition to send lots more gold at once. For more gold, the Expedition needed more Earthling miners and a new rocket terminal. But in Africa mud interred the mines as well the miners. In Sumer mud topped the Bad-Tibira refinery. Mud smothered the rocket terminal at Sippar. Mud covered all the stone and minerals Sumerians needed for building. 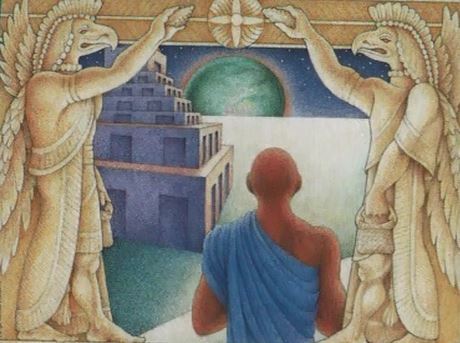 Ninurta, who ran the recovery for the next 7000 years, taught the Earthlings who survived how to make bricks and bronze tools and build houses, temples, canals and dams. “When the Anunnaki gods decided to help humans learn skills of survival after the flood, not all humans were convinced this was a good idea. Some did not trust the brutal gods who had oppressed them for so long, and therefore remained in their mountain hideouts, too scared to enter the newly established settlements of people. It looked to them like a new version of the labour camps that persisted for millennia around the gold mines.